If the popularity of Vine and Instagram Video taught us anything, it’s that no one wants to watch the full 15-minute version of your latest vacation, concert or brunch meetups. To help simplify the video editing process, TNW USA Boost startup winner Fly Labs has released Clips, an elegantly-designed app that allows you to easily make professional-quality videos using quick drag and drop gestures. Unlike the aforementioned social apps that require you to start and stop recordings in a single session, in Clips you can import up to 100 clips from your Camera Roll to combine into one video. To start, select the videos you want to include and arrange the clips by dragging them in your desired order. You can trim the length of each clip with the left and right sliders, and add an optional dissolve transition effect between any or all of the clips to fuse them seamlessly. If the clips’ various sounds ruin the flow of the video, you can also opt to add music from your Library, or record your own soundtrack with the microphone button to round things out. You can also just make the whole thing silent. When you’re finished editing, Clips lets share the video via Instagram, Facebook and plenty of other popular social apps. (Though if you share to Instagram, you’ll have to watch out for Instagram’s 15-second limit.) You can also save your final video back to your Camera Roll. 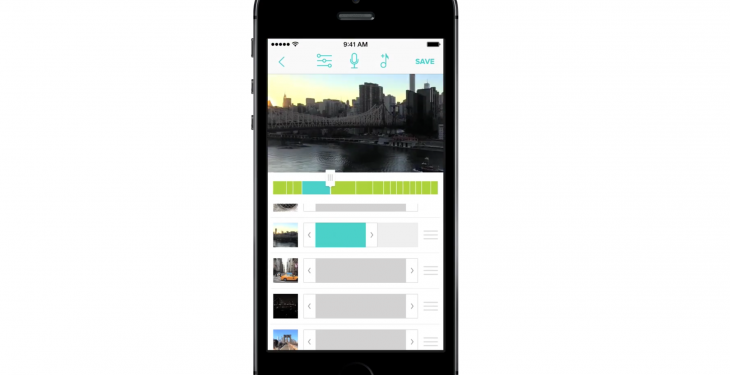 Now, you’ll never have to worry about timing your video recordings in advance. Just use the native iPhone Camera app to record, and then put them together in Clips. Clips is currently limited to iOS devices, but the app is free to use with a discreet watermark. The pro version goes for $4.99. This article is brought to you by Fly Labs: Get creative with video.